A COLLISION on a main Sussex road this morning (Sunday April 12) has left a 22-year-old man dead and a 17-year-old girl fighting for her life in hospital. Police confirmed the man from Bognor Regis died at the scene of the crash on the A29 Shripney Road, Bognor, while his front seat passenger, a 17-year-old girl from Ford, is in a ‘critical’ condition in Southampton General Hospital, having sustained serious head injuries. The accident happened at around 6.50am this morning and fire crews, an air ambulance and police were at the scene. 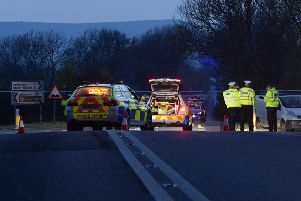 A police spokesman said: “At approximately 6.50am this morning, Sunday April 12, an RTC occurred on the A29, Shripney Road, Bognor Regis near to the junction with Shripney Lane. “A silver Peugeot 106 and a pink Kia Picanto were involved. “Both vehicles were travelling northbound at the time of the collision. “The Peugeot subsequently left the road and struck a tree. The driver of the Peugeot, a 22-year-old male from Bognor Regis, was pronounced dead at the scene. “A 17-year-old female front seat passenger from Ford was airlifted to Southampton General Hospital with serious head injured and is in a critical condition. “The occupants of the Kia are uninjured.